Dealing with your baby’s diapers is probably the only thing about having a baby that is not on your list of favorite things. A baby’s diapers have to be changed several times a day so having the right diaper pail to contain them in is very important. Improperly contained dirty diapers can make the nursery and even the whole house smell badly. We looked at the 20 most popular diaper pails on the market and considered their performance in odor control, ease of use, refills needed, space for dirty diapers, size and capacity and other considerations. The three diaper pails reviewed below topped the charts in all of the categories we looked at. Any one of these diaper pails would make a great addition to your nursery. Diaper pails come in all shapes and sizes. While some pails can be used for either disposable or cloth, more than likely you will be looking for a diaper pail that works with one or the other. For this reason, knowing whether you will be using cloth or disposable diapers is one of the first things you will need to decide. With all of the different types and styles of diaper pail on the market, you will want to be very clear on your preferences and needs before you start shopping. There are wet and dry systems for disposing of diapers. We will go over those systems in depth in our buyer’s guide. The powder coated steel that this diaper pail is made of provides maximum odor control against cloth or disposable diapers. Unlike plastic pails, steel is not porous and does not allow the smell to get out. There are no special bags or refills needed. You can use a regular tall kitchen bag rather than having to purchase expensive liners. There are rubber seals that go around the rim of the diaper pail and also around the sliding lid. These seals make the pail airtight which holds in the odors and prevents them from permeating the room the pail is in. To minimize any air disruption, there is a sliding lid that makes disposing of the diapers fast and efficient. The child safety lock feature keeps curious children and pets put of the diaper pail. Another feature is the slow close lid that also prevents pinched fingers. These safety features give you peace of mind that your other children won’t get into the pail. The oval shape fits well into any spot you want to keep it. It has a 50 diaper capacity to minimize how often the pail must be emptied. Ubbi steel diaper pail is available in 3 limited edition prints and an array of colors to match any nursery décor. 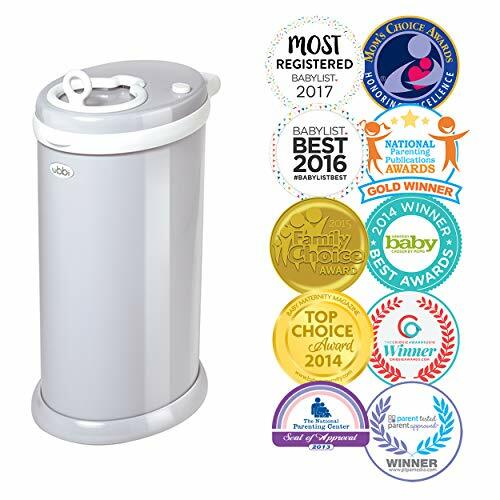 This diaper pail has received 6 prestigious awards that attest to its high standard of quality, performance and sleek design that you are looking for. Welcome to the new gold standard in diaper pails. The Munchkin Step Diaper Pail by Arm and Hammer has a “best-in-class” odor control that is superior to others coupled with a modern, sleep aesthetic. This diaper pail will look great in any room you put it in. It has an easy to use foot pedal that eliminates the need to use your hands to open the pail. One of the unique and special benefits from using this diaper pail is that Munchkin will plant a tree for every pail sold. This can bring parents the peace of mind that they are doing something that is good for the environment by buying that pail. The child proof feature keeps other children out of the diaper pail for additional safety. The STEP diaper pail works just fine with refill rings and snap, seal and toss refill bags. It is up to personal preference which one you choose. There is a lavender scented puck that absorbs odors when the pail isn’t being used and keeps the area smelling fresh. These puck cartridges are refillable, as is the refills rings. The Diaper Dekor Classic is one of the three that topped the charts for many reasons. It is superior at containing odors so it keeps the nursery smelling fresh and clean. Messing with the diapers is unnecessary with this diaper pail. Just use your foot to press the pedal and drop the dirty diaper in…that’s it. 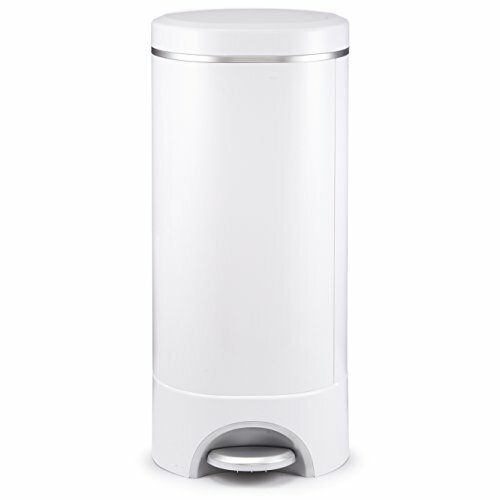 The liners of this diaper pail are very economical. Once the diaper pail isn’t needed as a diaper pail anymore, it makes a great trash can. The contemporary look is sleek and stylish and matches most décor. The capacity of the pail is 45 newborn dirty diapers. The rubber sealed door keeps the odors where they belong…in the diaper pail. There are no filters or batteries needed for this diaper pail. It is child and pet safe. The liners are easy to replace and easy to remove as well. The pail is made of ABS plastic that is scratch and odor resistant and is long lasting too. It will hold up to 45 diapers at a time so you don’t have to change the pail as often. Disposing of diapers into a regular open topped trash can usually leads to very unpleasant odors throughout the house. Diaper pails are special diaper trash cans that have air tight lids and other special features that keep the odors contained and ensure that your home remains smelling fresh. The three top rated diaper pails featured above are all constructed from heavy duty material such as steel or ABS plastic, to prevent odors from being released into the air. With the right diaper pail in your nursery, the room and your house too will never get that bad odor. These diaper pails have special features including refills, odor blockers and air tight lids among others that combined, work to ensure a sanitary, fresh-smelling room. Many have foot pedals so your hands can stay on the baby while you throw it away. Read our buyer’s guide below on how to choose the right diaper pail for your needs. This information will help you sort through the many choices available so you can make a good decision that will work for your baby’s nursery. When you are outfitting you baby’s nursery, don’t forget to get a good quality, sturdy diaper pail. This is a crucial piece of baby equipment that, when it is the right one, will help keep diaper odors from ma king your house smell bad. There are dry and wet diaper disposal systems that parents will choose from. 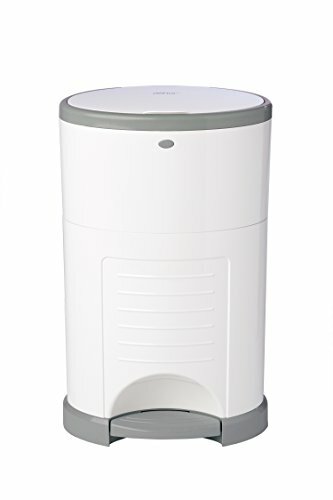 A dry system is one where a diaper pail is in the room that rinsed cloth diapers are kept until it’s time to wash them. It you are using disposable diapers; the dry system just involves throwing the diapers into the diaper pail and replacing the liner when the pail is full. A wet disposal system means that the cloth diapers are soaked in a mixture of white vinegar, baking soda and water until they are washed. Disposable diapers will not involve using a wet disposal system at all. Depending on the diaper pail, it may require a special plastic liner or you can just use a regular trash bag. There are many different types of diaper pails on the market. We’ve listed the different kinds below so you will understand the differences and be able to decide which one is the right one for your baby’s nursery. Diaper Pails for Cloth or Disposable Diapers – Some basic diaper pails may be as low as $20 and then there are the higher end models that cost more but have more features as well. These pails will either use plastic garbage bags or special liner bags that go with that specific diaper pail. If the pail is specifically for cloth diapers, it will sometimes have a cloth bag that can also be washed along with the diapers. Diaper Pails for Cloth Diapers – If you are using cloth diapers, you will want to choose a diaper pail that is heavy duty and that has a tight fitting, air tight lid that locks. If you want to soak the diapers in a solution until they are washed, make sure the diaper pail is airtight, and has a lock and heavy duty handles that can hold the weight of the pail when moving it to the laundry room. You will use a diaper pail day and night for the first couple of years of your child’s life so making sure you have a good one is very important. There are diaper pails that are very basic and some that make life a lot easier. Look for these features when you start shopping around. Bags or Liners – Depending on the type of diaper pail you choose, they will either be used with pail specific liners that go with the model you have or they will work with regular tall garbage bags. One of the benefits to the special liners is that they may have odor fighting properties that work to keep odors away. Regular trash bags don’t have that odor fighting ability so the diaper pail could be very smelly. If the diaper pail is for cloth diapers only they will sometimes come with a cloth bag that is designed to be washed in the washer when you wash the diapers. Capacity – there are many different pails that advertise different capacities. Despite what the description says, you should expect the pail to hold less than what they claim. As the baby getting bigger, there is less room as well. The numbers that are given are usually based ob newborn diaper size. Child Resistant Lid – Plastic liners can be a suffocation hazard to little ones. Also, wet pails that have solution in them can be a drowning hazard to little ones. For these reasons, the diaper pail you get needs to have a solid, locking lid that they can’t get off. Most of the diaper pails on the market that are not the very basic design, have a childproof mechanism of some kind for their safety. Step pedal diaper pails are also harder to get into, but the pedal shouldn’t be the only thing present to keep little ones out of the pail. Comfort – Comfortable, strong handles and a design that works with your décor and needs is the best thing to look for. Ease of Use – You want to purchase a diaper pail that is easy to use. Pedal diaper pails that are opened by pressing down with your foot are much easier to use when you have your hands full with the baby. There are many different types of diaper pails, some that even separate all the diapers and wrap them individually. These pails are great for really smelly diapers. Odor Containment – Air filters, special scented liners and other means of helping to eliminate odors from getting into the room are all desirable features to look for. A room that smells like a diaper pail is not pleasant. Keep the nursery and the house smelling good by utilizing these extra odor fighting properties. Hands Free Operation – The diaper pails that are opened by pressing down on a foot pedal. This makes it easy to open the pail and not have to use your hands at all to take the lid off. Some even have motion-sensor units that you just wave an arm over to get them to open. Air Tight and Sealed Lids – It is the strong seals of airtight rubber that keep odors from permeating the room. In the case of the Diaper Genie, there are several steps that help to keep in odors. A diaper pail is not a purchase to take lightly when you will be using it for two years at least and using it every day, multiple times a day at that. It is important that you take the time to sort through the different diaper pails available and make a decision that will be the best one for your baby’s needs. The information in this buyer’s guide will give you the knowledge about all of the options you have available so you can make the right decision and not waste money on a substandard diaper pail that doesn’t do what you need it to do. Purchasing a quality diaper pail that has all the features you want and need will make your diaper changing activities much easier and certainly much less smelly.